Lately, I have been making lots of bread. Making bread is a satisfying experience. Unlike desserts, bread is an essential part of the meal that you do not feel guilty for eating too much of it. And the smell of fresh bread is wonderful. I did not have much experience with yeast bread before. I usually just followed the recipes in Best Recipes closely and they never failed me. This time, however, I was curious to try out the Japanese bread making recipes that have been very popular among the Chinese food bloggers. The bread that I grew up with, made by Chinese bakery, is soft and fluffy, without a thick crust. The dough is lightly sweet. And they remain soft and fluffy for a few days. There are different fillings that you can put inside. To balance the sweet flavor, the fillings are usually savory. Like, bbq pork, hot dog, curry chicken and ham and cheese. The red bean paste is one of the more popular sweet fillings. After reading this post on Christine's recipe, I could not wait to try it out. But the recipe is originally written for bread machine. 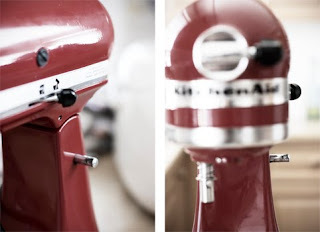 I kept searching and found a similar recipe adapted for electronic mixer on Corner's Cafe. After three trials, I finally got the bread that I thought was just as good as in Chinese bakery. The following is my adaptation of the recipe. Fit the mixer with the dough hook attachment. Sift bread flour, plain flour, milk powder, suger and salt to the mixing bowl. Add in yeast and mix well. Add in water roux and beaten egg. 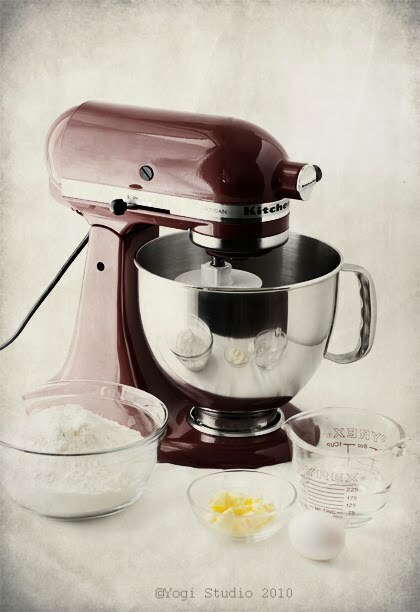 Turn on the mixer at slow speed and slowly add lukewarm water until the dough form into a nice ball of dough. Continue to knead the dough at speed 4 to 5 (Kitchen Aid) for 5 minutes until the dough is somewhat smooth and not sticky. Add in butter, continue to knead at speed 4 to 5 for another 6 to 8 minutes, or until the dough is smooth and elastic. Take the dough out and knead it by hand a few times and then form the dough into a ball. Clean up the mixing bowl and grease it lightly. Put the dough ball back in the mixing ball. Cover the bowl with saran wrap.Put the dough in a draft free places.And let the dough rise to double in size, about 1 to 1 1/2 hour depends on the temperature and humidity at the time. After the first rise, punch down and take out the dough. Knead it a few times and divide the dough into equal size. I usually weight each portion to make sure they are of the same size. 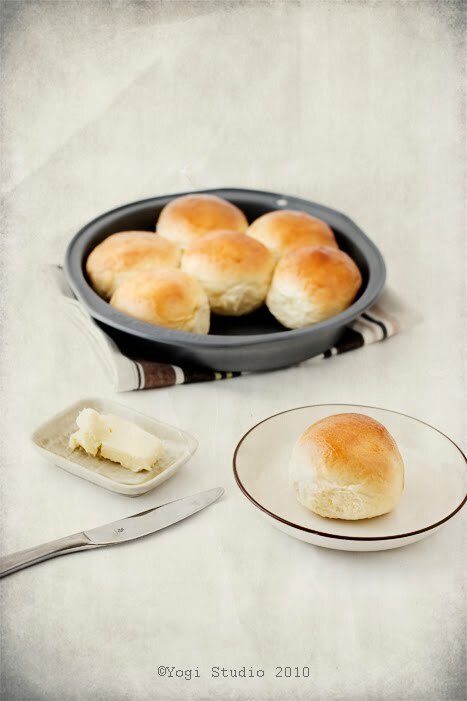 For the plain sweet bread, each dough ball is approximately 60g. Shape the dough into balls and put them in a slightly greased baking pan. Cover with saran wrap and let it rise the second time in a draft free place, until the doughs are double in size, about 1 hour. Preheat oven to 350F. Brush the surface of the bread with egg-wash. Bake the bread for 15-20mins or until golden brown. If you like a shiny surface, brush the bake bread with a thin layer of butter. 1.After kneading the dough, form the dough into a ball and let it rise in the greased mixing bowl. if the dough does not spring back, then it is ready. Making bread with filling: After the first proof, divide the dough into equal portion and shape the dough into balls. Let the dough rest for 10 mins. Using a rolling pin or use your finger, form the dough into a flat round shape. Put the prepared fillings* inside the dough and wrap the dough around it to form a ball. To shape the dough into flower shape, flatten the dough ball with the palm of your hand. Make 5 cuts around the dough. Place the shaped dough on a baking pan lined with parchment paper/silpat. Cover with saran wrap and let it rise for second time. Bake the bread as in basic bread recipe. 5. To make bread with filling, put the filling inside the dough. 6. Shape the dough, let it rise for second time and then bake it in the oven. I have reduced the amount of milk powder to adjust to my taste. You may not need all the 150ml of water to make the dough form into a ball. It depends on the weather of the day. The ideal temperature for proofing bread is around 85F. In order to have fluffy bread, you have to make sure that the dough rise enough. Otherwise, the bread will come out dense and tough. (This is from my own experience!) To make sure that the condition is right for proofing, I turned on the oven to 200F and when the temperature is ready, I turned off the oven. Open the oven door and let the oven cool down for 10 to 15 mins. Then, put a cup of boiling water in the oven with the dough to ensure the humidity is maintained inside the oven. Close the oven door and let the dough rise. You can buy pre-made red bean paste in Chinese or Japanese grocery store. I just realized that after so many bread kneading I had done lately, my beloved Kitchen Aid was acting up on me. Fortunately, it was not a big problem. N helped me to hammer the pin down and it was fine. I was a bit disappointed with it but N reminded me that when I bought this model a few years ago, I did not expect to do that much bread making. Otherwise I should have got the more heavy duty one. From now on, I may have to hand knead my bread! lovelyandroid and lynne - Thanks for stopping by. Hope you will try out the recipe and enjoy the making of this versatile bread! Breadmaking is very satisfying, isn't it? 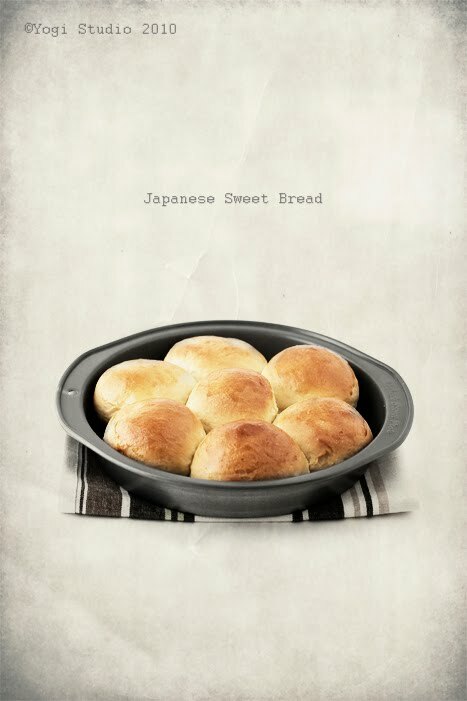 You bread looks wonderful -- such lovely dreamy shots as well! lisa - Yes, I love breadmaking. I wish I can have more time to do that! elra - Thank you for stopping by. Hope you like the bread! 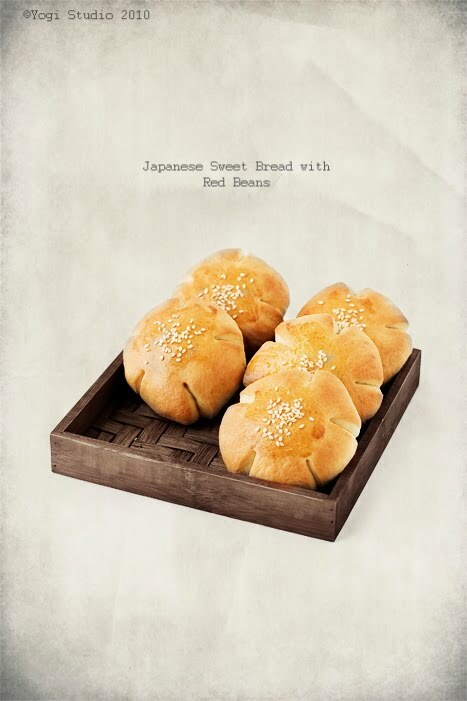 I'm from Hong Kong as well, and I have such fond memories of sweet breads. I'll have to put this on my list of recipes to try. Mrs.Hot Cocoa - Welcome to my blog. Hope you'll like this sweet bread. can you please tell me how much yeast do i need? Sorry that i left out such an important ingredients. I used 2 1/4 tsp of instant dry yeast. Is there any difference between Bread Flour and Plain Flour ? In North America, chefs just use all purpose flour, or whole wheat flour ( more healthy) or a mixture of both. These are the common types of flour sold in supermarkets here. Jacqueline - Bread flour has higher gluten content than all purpose flour. Higher gluten is needed to give structure to the bread so I don't recommend to use all purpose flour only. The brand of bread flour I use is Rogers and I usually get it from Save-On. I don't think you will have problem finding it in other supermarket in Vancouver. Hi Grace! Thanks so much for sharing this recipe. I also live in Vancouver and cannot seem to find plain flour. Is plain flour the same as cake flour or all purpose flour? I found the Rogers Bread flour you mentioned above. Thanks again! Hi Grace, me again. I forgot to ask if you use regular butter which is salted or unsalted butter in the recipe. Thanks! Hi dear, you should use all purpose flour and unsalted butter for the recipe. Have a good day! Thanks Grace! I will try it this weekend! Hi, I like to give this recipe a try. I noticed you measure all ingredients by grams. For a precise outcome, would you be kindly to tell me how to measure them by cup, table spoon and tea spoon? Thank you! hi there, i;m confused about proofing bread, can you please explain it more? when you said proofing the bread, you put the dough in the oven of 200 degree and a cup of water and let it rise to double, is it before we bake or just after we finish kneading the dough the first time?